If they'd called it banana passionfruit, I would've thought it was a custom blend and not a single species. But "curuba" was the intriguing name on the licuados menu; the uncommon translation "molly fruit" must allude to the taxonomic descriptor Passiflora mollissima. 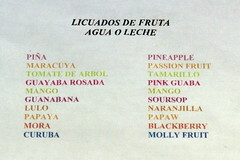 For the more exotic varieties, this Honduran shop prepares its licuados (about 20 fl. oz. 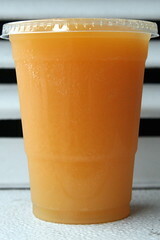 ; $2.50) from packets of frozen pulp, not fresh fruit, and though I had mine blended with water rather than milk for the best available approximation of pure molly fruit flavor, once more I was reminded of summer-camp orange drink. At least it was orange. 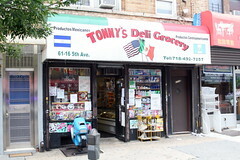 I also noted that the refrigerator case contained jars of sour cream labeled "Gualamalteco," "Hondureño," "Mexicano," and "Salvadoreño," whose fine distinctions I couldn't discern. More to explore here.